Many times the success of a ride or race can be enhanced by what you do before and after the ride. And that's where 100% organic Qoleum Sportscare products from Belgium come in, including the new Qoleum Sportswash for the body. The Sportswash not only helps facilitate the repair of muscle tissue but also helps eliminate lactic acid, plus the Qoleum Sportswash removes embrocations (like massage gels, etc.) and other oils from the skin without harming the body's natural oils. Qoleum Sportswash is made in Belgium from the finest natural ingredients and is easily applied with a clean towel or wash mitt. It is available in a 16.9 oz. (500 ml) bottle with an MSRP of $17.99. Embrocations (liniments/lotions) in three strengths: Low (for 50-77 degree riding conditions), Medium (for cold or wet conditions in 32-59 degrees) and Hot (for very cold or wet conditions, under 50 degrees). The Medium strength is also available in individual use packets so that it can be applied during a ride. MSRP: $15.99 for a 6.76 oz. (200ml) jar. Bronzing Cajeput Oil: A pre-sports oil for riding temperatures above 50 degrees. Works best when used in combination with Low or Medium Embrocations. MSRP: $19.99 for an 8.45 oz. (250ml) bottle. Pre Sports Oil: Apply to muscles before a ride to improve blood flow. MSRP: $19.99 for an 8.45 oz. (250ml) bottle. Post Sports Oil: A great way to remove lactic acid from the muscles. MSRP: $22.99 for an 8.45 oz. (250ml) bottle. Recovery Oil: Ideal first aid application for bruises and muscular pain. MSRP: $19.99 for an 8.45 oz (250ml) bottle. Antifriction "O": Preventing saddle sores is easy with Qoleum's antibacterial, antiseptic and antifungal combination cream. MSRP: $15.99 for a 6.76 oz. (200ml) jar. Soothing "O": Provides temporary relief to muscular aches and pains, lumbago, arthritis and rheumatism with this all-natural product. MSRP: $25.99 for a 6.76 oz (200ml) jar. 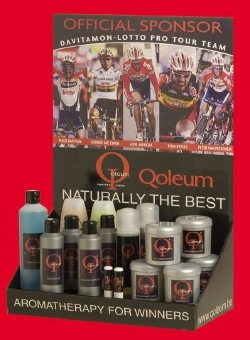 "Qoleum Sportscare products are great for any cyclist, whether a weekend warrior or a pro racer," says Curt Shelman, Operation's Manager for Paceline Products, the exclusive distributor of the Qoleum Sportscare products to the bicycle industry. "Bicycle riders are beginning to discover the benefits of Qoleum oils, liniments, creams and now the Sportswash and we have the complete line available to IBDs." Purchase 24 Qoleum Sportscare products, mix or match items and receive a FREE POP Display! Qoleum Sportscare is an official supplier to the Davitamon-Lotto Pro Tour Team. Now available in nine colors, including the newest  Ruby Red  the Jimi Wallet is selling extremely well throughout North American IBDs. The Jimi Wallet is manufactured in the U.S. from 100% recycled materials and the company donates 1% of sales to environmental causes. MSRP: $15. Purchase 18 "Jimi's" and receive a FREE POP Display!